This post involves a favor for you and a favor for me. The favor for you is that I’m going to show you a number of ways to save time marketing your rental units to prospective tenants. The favor for me, I hope, is that some of you will help me with my problem. I want to refinance my seven-unit and I’m looking for the lowest rate possible. 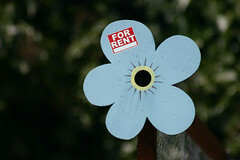 First, let’s talk about marketing your rental units. Businesses like to refer to the “pipeline” of new customers coming in, but the pipeline is really more like a funnel. At the top, you have the pool of people who might be interested in a rental unit like yours. At the bottom, you have the people who are qualified and will take it. Your mission is to get as many people as you need down to the bottom of the funnel, as quickly as possible. It’s a little different than other business marketing strategies because your inventory is more limited. The average business wants X many new customers in any period, but certainly wouldn’t mind 5 times X. But if you need two qualified tenants, finding 10 isn’t really going to do you any good. The steps you follow are completely different at each level of the funnel. At the top, you want to get to a lot of people, spending as little time as possible on each one. This is purely outward messaging. Your two goals are a) to get the message out in front of as many interested people as possible and b) to hear from as few unqualified people as possible. I agree with the late, great ad man David Ogilvy, who said the best ads were highly informative. Now this conflicts with the opinion that people will only read so much on any page before they get bored and move on. Both of these views are completely correct! Fortunately, it’s possible to format your ad in such a way that people who get bored easily will have all the information you need, and people who want a lot of information can still get it. This ad would work pretty well for Craigslist, or a flier posted at the supermarket or anywhere else where people put up fliers. It’s pretty wordy for a newspaper ad, but you could get rid of the third paragraph without losing much of the important content. However, did you notice that the email address and phone number were included twice? Assuming you aren’t paying by the word (which is the case for Craigslist or fliers), you should include them at the end of every paragraph. Of course, you also want to get some pictures in there if possible. I did not put the email and phone at the end of the first paragraph because I wanted everybody to read the second paragraph. That’s the “weed-out paragraph” where you tell people what might make them not want the apartment, or not qualify for it. Why are you doing this? So you don’t get time-wasting phone calls from people who will never be your customers. You certainly don’t have to broadcast any of the problems with the unit (“Really small closets!”), but you shouldn’t lie. It’s counterproductive as well as being wrong. Let’s say you advertise a two-bedroom, but one “bedroom” is only 50 square feet and unheated. If I’m looking for a two-bedroom and come see your place, I wasted my time – and yours. Help Me Refinance My Loan! I’m looking to refinance a seven-unit mixed-use building in Somersworth, NH. The building has three commercial spaces and four one-bedrooms, is in good condition and fully rented, and is worth about $455,000 on a cap rate of 8. I owe $300,000 on it and would like to roll that loan over into a new loan for the same amount ($300,000). I’d like to amortize over 20 years, with the longest possible notes (my dream would be a 20-year fixed, but I’ll take a series of notes if necessary – but the first note must be for at least seven years). I have excellent credit. Why am I doing this? Well, I keep hearing that rates are really low, and now is the time. So let’s see. Send me a private message through BP if you can offer me a really low rate, or know where I can find a really low rate, that meets my requirements as set forth above.